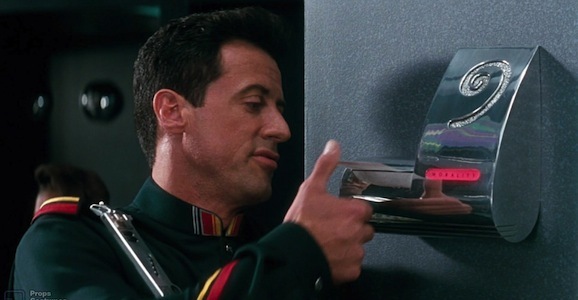 Sylvester Stallone’s 1993 dystopian sci-fi actioner Demolition Man is one of my all time favorite movies. No joke, in grad school I wrote a lengthy paper about it. (And it predicted Arnold Schwarzenegger’s political career. Sure, he didn’t become president, but governor of California is nothing to sneeze at.) It’s simultaneously futuristic, but also a definite artifact of the 1990s. One of the pieces of the film that most people seem to cling to involves the futuristic method of going to the bathroom. Instead of using squares of toilet paper to clean yourself up, like we do now, there are three seashells. How that works remains a mystery, but now we know how this peculiar piece of science fiction came to be. As a quick refresher, Demolition Man follows the exploits of John Spartan (Stallone), a cop who, framed for murder by his nemesis, super criminal Simon Phoenix (Wesley Snipes in awesome stripped spandex pants), is frozen cryogenically as punishment. When Phoenix escapes into a peaceful future ill equipped to cope with his particularly vicious brand of crime—no one swears, fights, swears, fucks, or, again, uses toilet paper—Sandra Bullock thaws Spartan and all hell breaks loose. So there you have it, one of Waters’ buddies was dropping a deuce and answered the phone, and his bathroom decorations found their way into a major motion picture. It’s silly and random and just the kind of inside joke and funny little aside writers love to throw into their work. You knew there was a story behind this unusual bit of sci-fi lore, and now you know what it is. Are you satisfied or did you hope there was more? The Adventures of Ford Fairlane is Awesome. I’ve been seeing more and more of a following develop for recently. I haven’t watched it since I was in high school, maybe I’ll have to give it another chance soon. Hudson Hawk will be appreciated one day. This I vow.